Ladies size 12, 3 piece cruise/evening wear, lime green/lavender polyester. Ladies size 12 3 piece wedding/ evening wear outfit. It has elasticated waist and is fully lined. There is tie knot at centre from. The outfit by Chianti is feminine and very pretty. It is washable and has been worn one twice. The outfit is a sheer blue fabric and the floral pattern is a jade Green with a velvety feel. The skirt and jacket are a size 12 and the top is a size 10. The skirt and top are fully lined the jacket is not it is sheer. 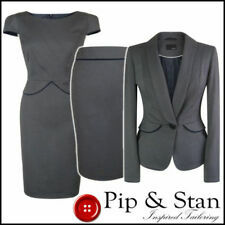 Alexia London 3 Piece Ladies Skirt Suit - Made In UK. Boxy Style top, Darting at the Bust - Lined. Flowing Skirt with Insert Panels - calf length - Lined. Royal Blue fitted Jacket with 3 Blue buttons which have 3 diamantes on each of them. In excellent condition only used once and been dry cleaned. Original price for this outfit was £199. Berkertex Petite Blouse Skirt Suit. Blouse Jacket with Inner & Scarf Size 12 ~ Skirt Size 12. Colour: Light Khaki Beige. Waist unstretched 12, stretched 20. Armpit to armpit 20. Fisser Suit - Jacket, Long Skirt & Top. Size 40 (12). Silver-Grey W/Lilac Sheen. Size 40 (12). Colour is a silver grey with a lilac sheen which reflects the light. Top has a zip at the back - the skirt fastens with a zip and button.". Skirt - Waist 30 Length 33". Lovely light silky material - label says "Wash at 30" - has only been handwashed but I think it could go in a machine. Part of the Frank Usher Group. Single breasted jacket with button fastenings. Long sleeved with a chiffon trim & finished with tiny sparkling seed beads. Gorgeous calf length skirt & matching top & jacket suit. 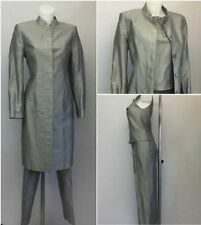 Ladies EASTEX 3 Piece Skirt & 2 Matching Tops Suit. Wedding size 12. Designer. Ladies EASTEX high quality 3 Piece Skirt & 2 Matching Tops Would make a lovely wedding outfit by adding cream hat shoes and handbag. Size 12. Designer.. Condition is Used. Dispatched with Royal Mail 2nd Class. Check out my other items as I am happy to combine postage. Feel free to save on postage by collecting the item from DN14 9JP. I try to recycle all my packaging. My items are all laundered but may not be ironed as packing will crease them again. My items all come from a non smoking home. Happy bidding. Stunning Jacques Vert 3 piece suit size 12. Peach/Cream Floral. Mother Of Bride! Sleeveless top: 40% nylon, 60% viscose, UK 14. trousers and jacket: 30% wool, 70% viscose,UK 12. Spectrum casual suit, top size 10, skirt size 12. A Spectrum suit consisting of a skirt, a vest and an over shirt The skirt (Spectrum) is size 12, wrap-over style, waist size -74cms. length - 87cm, lined, permanently pleated and has two button on the waist band at the front. CAMI/VEST TOP and TROUSERS. Straight-leg TROUSERS in SATIN-LOOK Fabric. Colour NAVY BLUE ~ all pieces machine-washable. Satin-look fabric for collar, covered buttons, front button-band trim and cuffs. Berkertex by Littlewoods - Ladies Black 3 Piece, Single Breasted Skirt Suit. Skirt :- Size 12. Length - 24". Waist - 15". Zip and button at the back. Material 100% Polyester. Consists of a skirt, top and jacket. THE TOP IS 32" ARMHOLE TO ARMHOLE PLUS BRA FRONT. SKIRT LENGTH IS 24". JACKET BACK LENGTH 21" IT IS SLIGHTLY LONGER AT THE FRONT. The colourful subtle colours are mainly in varying shades of green, purples, burgundy and cream. See Photos. The fabric is semi sheer and the skirt has an elasticated waist and is part lined. The top has long sleeves a Scoop neckline with a fabric tie decorated with beads. This is a very nice suit from a Russian brand. Great quality, deep chocolate brown colour, very good used condition. Jacket chest is appx 48cm, trousers: waist - 40, hips - 48cm. Inside leg - 80cm Unique for the UK, you won’t find a similar one! From a non-smoking house. I am having a clear-out so please see my other items (something new is added almost every week). Payment within 24hrs from the end of the auction please. I am happy to combine the postage. Thanks for looking and bidding! SKIRT UK 10. 2 X 11" SIDE SLITS, FULLY LINED, SIDE ZIP FASTENING, BLUE BELT WITH GEM DETAIL. LENGTH 27" SHOULDER TO HEM. JACKET/TOP UK 12. PADDED SHOULDERS FOR GREAT SHAPING, COLLARED, BUTTON FRONT. Ladies 3 Piece Suit Ivory White Size 10 -12 Vgc Mother Of Bride Wedding ? Skirt size 12. All in Perfect condition only worn once for a wedding. Contains jacket size 10. Halterneck bodice top Size 10. 3 pieces outfit by Belinda Ch'ng in size UK 12. Jacket - wonderfully structured, very elegant 3/4 sleeves with pleated cuffs details. Single breast with 4 pearly button fastening. Lapels & collar, faux pockets. Pale Blue 3pce Suit in excellent condition. Jacket and Skirt fully lined. Just been dry cleaned. STUNNING NAVY BLUE THREE PIECE OUTFIT FROM ANOUSKA HEMPEL - UK 12. It has a boned bustier top which is strapless and fastens to the side with a full length zip. The knee length skirt in matching fabric is a sleek pencil skirt with no waistband and fastens to the back with a concealed zipper. Both Roman originals pieces are size 12. Matching bag from Next. This suit is in excellent condition. Skirt is zip fastening (43" length). Jacket is button fastening (21.5 " length). Gina Bacconi Navy & Cream Blue Striped Suit 3 Piece Casual Outfit. A lovely casual set with elasticised waist pleated skirt, cream top and Over Blouse with padded shoulders. Shoulder to hem 63cm. Shoulder to hem 68cm. Lovely 3 piece Jacques Vert suit. Top, Skirt and Jacket and belt. Size 12 Floral pattern. Floral pattern. lined on front inside. Side slits. 1 button fastening. 100% Polyester.